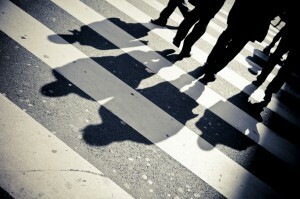 Crosswalks and the Right of Way for Arizona Pedestrians | Phoenix Personal Injury Law Blog - Breyer Law Offices, P.C. When you’re driving down the streets of Arizona and you come to a crosswalk with no lights or stop signs, do you breeze right through, or do you slow down and watch for pedestrians? Many drivers in the state and throughout the nation simply drive through crosswalks. In many situations, a pedestrian may even be in the crosswalk and a car will drive around that individual. Arizona law, however, provides restrictions for the right of way, especially when it comes to pedestrians at crosswalks. According to ARS 28-792, drivers who approach a crosswalk with no signals must slow down for a pedestrian approaching or in the crosswalk. Pedestrians, too, have a responsibility to keep themselves safe and to never enter the road when it would be unlikely that an approaching car could stop for them. The same law also prohibits drivers from overtaking those stopped at a crosswalk. Drivers must allow pedestrians in the crosswalk to safely cross the road and be out harm’s way before continuing. Despite efforts to reduce the number of Arizona pedestrian accidents statewide, numbers have remained high over the past two years. Data reports from the Arizona Department of Transportation (ADOT) show that more than 150 pedestrians are killed in car crashes every year. This accounts for more than 10 percent of all pedestrian collisions. Another 1,250 pedestrians sustain serious injuries when involved in a collision. These injuries occur in nearly 80 percent of the more than 1,500 pedestrian-involved crashes that take place throughout the state annually. Being struck by a vehicle is a highly stressful event, but if you’ve been injured you can seek recourse with the help of a skilled personal injury attorney in Arizona. The Husband and Wife Law Team does whatever it takes to help injured pedestrians hold the negligent driver responsible for their actions. We work to secure fair compensation in settlements that cover medical expenses, lost pay during recovery and the emotional heartache that comes with injuries and pain. For assistance with your case, contact the Breyer Law Offices, P.C. for a no-cost, no-obligation consultation.